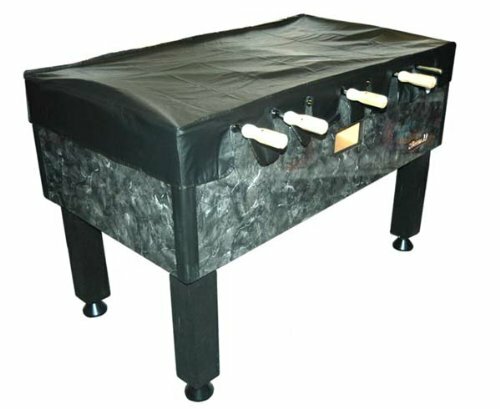 Unlike many pool tables, most foosball manufacturers don't provide a free cover to go on top when you purchase it. Since these don't come with your table, many people are forced into looking at aftermarket table covers. This creates a problem when trying to find a cover that will be an exact match to fit your foosball table dimensions.These covers also typically vary from indoor models to outdoor covers that are intended to keep your table from getting wet and impacted by the elements. Also, since many foosball players are forced to shop online for these aftermarket parts, the quality may be hard to determine in a picture. Just make sure you do your research if you are trying to buy a custom cover that will match specifically for your table. Otherwise, you can spend $25 or less on a generic size cover that will suit your needs. We here at Foosball Soccer would suggest that you really look at the dimensions of your table compared to the cover's dimensions and check into the return policy of the site before purchasing a foosball table cover online. If you follow these simple tips, you may avoid buyer's remorse.